Experience a renewal with one of our popular fragrances of refreshing cucumber mingle with those of lush cool green aloe. Let the sweet and mildly earthy fragrance of cucumber aloe restore your senses and cultivate a new perspective. 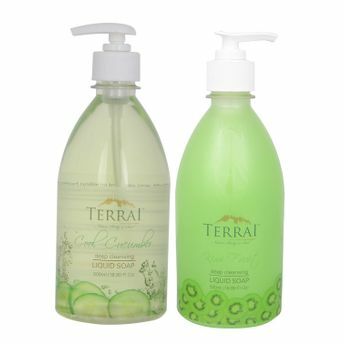 Kiwi Fruit - Deeply moisturizing Terrai Liquid Soap has the toning energy of natural kiwifruit that lathers light and foamy. This refreshing and softening liquid soap gently cleanses hands leaving the skin soft and moisturized.